In cases of severe NEC, intervention is needed to stop further damage to the intestines and to reduce the risk of infection spreading. Otherwise, it can cause septicemia and other organ damage. One or more operations may be performed and multiple interventions may be needed during the course of treatment. No surgical intervention is carried out without the signed consent of the baby’s parents who will first have the opportunity to discuss all of the possible options, and the risks involved, with one or more members of the paediatric surgical team and an anaesthetist. 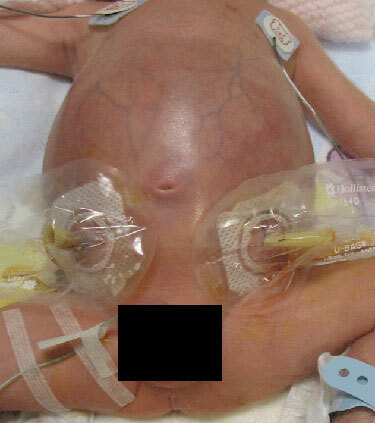 The stress on the body of undergoing surgery exposes an extremely ill baby with severe NEC to serious risks. They may not survive. It is extremely difficult to reliably differentiate between NEC and spontaneous intestinal perforation (SIP) before an operation, so surgery will confirm a diagnosis. SIP is less common and typically occurs earlier in life than NEC. One or two soft rubber drains can be inserted into the baby’s abdomen to allow gas or fluid to escape. The baby is given pain relief and some local anaesthetic during this procedure. This procedure is called primary peritoneal drainage (PPD), and is often done as a first measure, especially if the baby is too unwell for an operation. A bigger operation is usually needed to repair the leak or to remove permanently damaged (necrotic) parts of the intestines. In this picture two small drains have been used. The bags over the ends of the drains collect the fluid and gas that are released. Drains may be inserted and removed when the baby is in a neonatal unit. They are often held in place with a single stitch. A laparotomy is an operation done under general anaesthetic. It involves opening up the abdomen through an incision. The surgeon will review the state of the bowel, and aim to remove tissue that has died and to re-join healthy ends together (resection and anastomosis). The surgeon may decide during an operation to create a stoma, which is formed when a cut end of the intestines is brought up to the skin covering the abdomen and stitched in place. This is usually a temporary solution that allows the bowel contents to be diverted safely into a bag protecting the rest of the bowel and improving its chances of recovery. Once the baby’s condition has improved, the surgeon will take away (reverse) the stoma and re-join the bowel. This requires an operation under anaesthetic. Occasionally, the stoma may fall out of place and this may require further surgery. This picture shows a stoma which is fully matured and healed a few days after the initial operation. Parents will be taught by surgical staff how to care for the stoma, and some babies may go home with a stoma still in place. 222 (90%) of the babies who died were born before 32 weeks gestation. A second study2 found 236 cases in which a decision was made to operate on babies for NEC in the 27 paediatric surgical centres in the UK and Ireland between 1 March 2013 and 28 February 2014. It found that 189 babies had NEC and 32 babies had SIP confirmed at laparotomy. It estimates the overall incidence of NEC is 109 per 100,000 births. It advises that 1 in 4 babies diagnosed with NEC in the UK will require surgical intervention. It found that babies are most likely to undergo resection of a segment of bowel and formation of a stoma. It advises that approximately 80% of infants will survive to 28 days after surgery. It estimates that one quarter of infants undergoing a laparotomy will develop a complication. In babies who did not survive NEC, the median time between a decision to intervene and death was 2 days. Disclaimer: This information has been produced using contributions to meetings of the Special Interest Group in Necrotizing Enterocolitis (SIGNEC). It is intended to help parents and their families to understand this serious condition and ways in which it is treated. It is not a substitute for discussion with those responsible for the care of a baby as every baby is unique. The ultimate judgement regarding a particular clinical procedure or treatment must be made by the clinician in the light of the clinical data presented and the diagnostic or treatment options available. While all reasonable efforts have been made to check the contents of external sites, links are not an endorsement of those sites.